Returns the result of WAbstractItemModel::data() for the given row and column with the BarBrushColorRole, or null if no color is defined. Returns the result of WAbstractItemModel::data() for the given row and column with the BarPenColorRole, or null if no color is defined. Returns the result of WAbstractItemModel::data() for the given row and column with the DisplayRole as a double. Returns the result of WAbstractItemModel::data() for the given row and column with the DisplayRole as a WString. 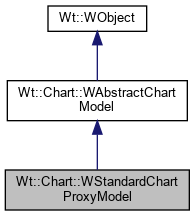 Returns the result of WAbstractItemModel::headerData() for the given column with the DisplayRole as a WString. Returns the result of WAbstractItemModel::data() for the given row and column with the MarkerBrushColorRole, or null if no color is defined. Returns the result of WAbstractItemModel::data() for the given row and column with the MarkerPenColorRole, or null if no color is defined. Returns the result of WAbstractItemModel::data() for the given row and column with the MarkerScaleFactorRole, or null if no color is defined. Returns the result of WAbstractItemModel::data() for the given row and column with the ToolTipRole as a WString.